I love you. You showed up last night. 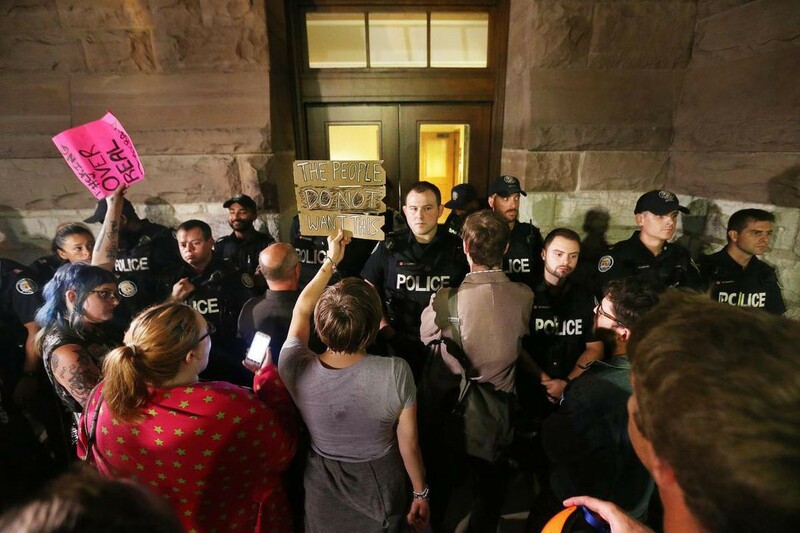 As Doug Ford pushed through a law to cut Toronto’s City Council in opposition to a judge, and insisted that the Charter doesn’t apply, you made sure he knew you were there. You banged on the walls. You heckled from the gallery. You blew sirens, played drums, and you yelled, “Let us in!”. And even if you couldn’t make it, you have been watching, signing petitions, calling your MPPs, talking to your friends. Democracy didn’t fail last night, it functioned exactly as intended Remember, the system isn’t broken, it’s built this way. For decades we have been lulled into sleep thinking that our votes is what ensures that we all get a say. Truth is, those at the top generally do whatever they want. We often don’t notice because they hide it from us. Sometimes what they want and what we want over lap — but when it doesn’t, there are no real check and balances. This is not a conspiracy theory. There are actual people, most of whom who are super rich or heads of think tanks, or self-appointed pundits who work together to promote their self-interest. They got what they wanted when the Liberals were in power too. Right now, they want to profit from real estate gerrymandering and from privatizing transit and roads. And a compliant Toronto City Council is necessary to push these policies. So Ford, himself a millionaire, is doing their dirty work. The new government and bureaucracy will cut in a thousand directions. They are just softening us up for the really deep attacks. Next up they will go after the minimum wage and other labour protections. Then it will be teachers, and rent control, and ballooning police budgets. This isn’t meant to scare you, it’s to say let’s get ready for the long haul. And knowing that they have a plan means they are predictable. + First, we must make it unprofitable for the ruling elite to continue to back Ford’s agenda. When we block the streets, goods can’t get when they need to and people can’t get to work. This hurts the bottomline. And when it hurts enough, they will rein their man in. They would rather have us at Queen’s Park at midnight than at Queen & Bay at noon. Don’t give them what they want. + Second, we cannot be divided. Soon, they will separate the good citizens from the bad protestors. The professional NGO types from the dirty activists. The ones they will call the pragmatic and practical leaders, and the rest of us. They will divide us based on tactics, the ones that speak to the media versus those that don’t. They will play the rural folks against the city slickers. They will use citizenship status, race, and neighbourhood. Don’t play into it. In public, in front of the government, to the media , on social media — focus on attacking the real enemies, those at the very top. Build a healthy cynicism of any self proclaimed leader particularly those that insist on spectacle over results and those that choose division over unity. When in doubt, listen to the bottom, those who have been in the trenches the longest know what’s up. Trust the work. + Third, you cannot do it alone, but we can do it together. There’s a famous book called ‘Freedom is an endless meeting’. It’s true. Go to meetings. Meet with your friends, your colleagues, your parent clubs, your union locals, or Fight for $15 chapter. Work with people. Hash out ideas, hold each other accountable, make each other stronger. Don’t just wait for someone to call you to a protest, go to a meeting, and figure out what in your community needs defending, and who will profit from destroying it. And then figure out how to make it hard for them to do so. + Finally, learn. For centuries many have fought for justice in the face of worse odds and won. Everything good we have — the weekend, accessible healthcare, maternity leave, basic rights — were won through struggle. There are books, films, poems, songs, paintings about these movements. Learn from them. Don’t be easily fooled by criticisms of Socialism, Communism, Anarchism, Indigenous governance systems— these are the ideologies of justice and ones they never want us to learn about. So learn about them. You don’t have to agree with all of it, most of us don’t, but this is where we can get ideas. Remember, we, you and I, are many, they are few. We, you and I, care and love us all. They just love themselves. We, you and I, have hope and justice on our side. They have power and the police, but only for so long. In the end, we will win.